BANGKOK (AP) - The king of Thailand wants to help ease Bangkok's legendary traffic jams and other inconveniences - and that means a few changes to the treatment of royals on the roads. On Friday, authorities distributed 25,000 handbooks to police and other officials with guidelines for directing royal convoys and new protocol for public appearances by the extended royal family. The manual overturns several practices that had quietly irritated the public in a country where open criticism of the royal family is illegal, punishable by up to 15 years in prison. 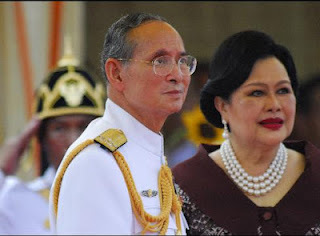 The revered 84-year-old King Bhumibol Adulyadej initiated the plan, saying it was time to change certain outdated protocol.